Believe it or not, I bought a new van! Why would I buy another one you ask? Because it's an excellent van, of course! I sat and thought long and hard about what I wanted out of a van, and I kept coming back to what I already had. The 59K has some cool features, but it comes up short on some of my must haves. Also, the diesel didn't do it for me. You'd end up being woefully short on LP capacity, and the sample van had the check engine light on - not a good sign. The better mileage may wash the difference in fuel cost, but not the $5700 option price for the engine. What I didn't get, which I wanted, was a second battery and solar. I'm exploring having the dealer add these items. The small improvements throughout the van - the tweaks they've made from owner feedback - really make the van more desirable. At least to me anyways. I also considered a Roadtrek for the engine alternator, but I don't really care for the layout nor the particle board cabinetry. I also considered the Lexor, and talked with the Pleasureway rep about it. 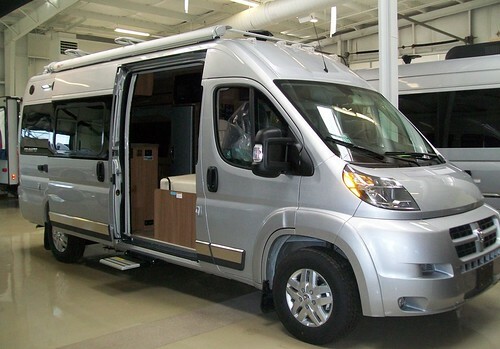 They are waiting on Dodge to provide vans with the rotating seats (turns out the rotating mechanism is an aftermarket part that Winnebago and Roadtrek use) and plan to have painted fenders on 2016 models. Just didn't care for the layout, or the $15k higher price tag. I also considered a Sprinter. The Era 170x was pretty nice, and I could get a good deal on it (~$94k), but ultimately, I don't want a van that big. The options on this van were the Fiamma roof rack & bike rack, the paint scheme, the shiny cabinetry and the screen doors. Ended up out the door in the low 70's. Actually I'm out the door with a check for $8k, as I traded my old van and a 5th wheel trailer for it and got cash back, but that is a long story. Re: Believe it or not, I bought a new van! Is it the same water heater in the new van as you had in your first Travato? Yes it is. It's something you have to learn to work around. Once you get the water hot, it will stay hot for several hours. The upsides to this water heater are no access panel on the outside of the van, and 1 less appliance using the limited amount of LP you have on board. Basically, I just have to plan showers a bit. For washing dishes, I just put a kettle on the stove. You buying a second Travato is a great endorsement of Winnebago's product. We know you've owned several RV's so you know about all the available systems. The Fiamma bike rack should work great for you and it is clever of Winnebago to include it as an option. You're probably still deciding whether you'll keep the Stowaway cargo box or not. If you get a chance to take some photos of the new Fiamma bike rack in action I'd be really interested in seeing them. If the van rear door access isn't restricted and you have a bit more height for storage under the bed I could see you doing fine without the Stowaway. Thanks. This will be my 3rd Winnebago product. The first two have each been a great value and trouble free. I'll be posting some pics with my E-bike on this rack and how you load/unload it. I think that the way it drops down to load the bike will preclude the use of the Stowaway 2. But I have other ideas! Since the bed is much higher, I have a roll-away Stanley box that I think will slide right in there and still have the bed lay down. Since this van has 3 more drawers, and the cubby/storage compartment ahead of the wheel well, I may have a bunch of items go in there, instead of in the bin. But all that remains to be seen. I doubt I'll use the roof rack for kayaks, or anything else, other than maybe mounting a solar panel. I'm averse to breaking my neck by trying to load a couple of yaks up there. Besides, the Oru will fit nicely in the back of the van. Very nice, and also nice to see that Winnebago is actually listening to the customer feedback and continually improving things. The full paint makes all the difference in the world in the appearance, compared to the way too much plastic on the unpainted versions. Does you current, I mean ex, van get the 18-20mpg, or is that one of the improvements? When did Roadtrek start using particle board cabinets? Our 07 has the super light, high ply count, plywood, with the tacky vinyl woodgrain on it. Particle board is soooo heavy to put in a class B. My last Travato consistently got 17-18. On my trip to the Keys and back, I got a high of 19.3 mpg. I can only hope it does this well oe better. I'm not sure if the Zion cabinetry is particle board, MDF or something else. It's not plywood from all the accounts I've read (or from what I saw in the video), but Gerry may be able to answer that better. I might have gotten past that point if I really liked the layout. The mid-coach side bath is something I don't care for. The weight of this material may be why the payload numbers are lower compared to the other Promaster vans. i have no idea what the zion material is. since i'm getting the cherry how can you tell? a picture was posted on this site i think that showed the cherry going over a base cabinet. i have no idea what the base cabinet is. my question is if roadtrek and winnebago use an aftermarket swivel why does Pleasure way have to wait for ram to provide it. On ours, you can look at the edges of some of the access doors to cubbies, or on some of the unedged pieces of the base cabinets themselves and see the multiply construction of the wood core. I assume they use it because it is very light when compared to regular plywood or the particle board style stock. Jim Hammill has said on several posts that Roadtrek uses no particle board. However the white interior zion i saw at the show looked like particle board to me-however i am not knowledgeable about this. if you showed me a board and said it was x i would believe it.